Shuffling its feet and avoiding eye contact, the Coachella Valley Music And Arts Festival is finally ready to be a grown-up and own up to what it did: namely, reuniting Guns N’ Roses for a couple of headlining sets, scheduled for April 2016 (and thus, considering Axl Rose is involved, likely to actually start some time in late July). After years of estrangement and rivalries—rooted in ego, addiction, and increasingly ridiculous headgear—iconic members Rose and guitarist Slash will be coming together onstage for the first time since 1993. 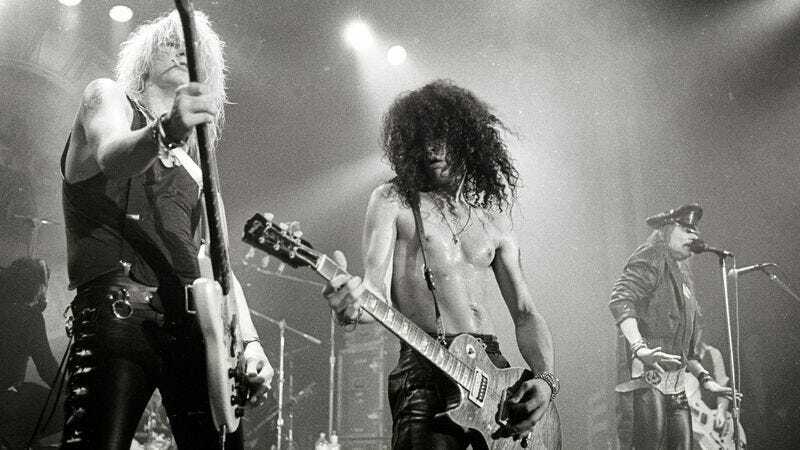 It won’t be a perfect reunion, though; although the band’s Appetite For Destruction-era bassist, Duff McKagan, has also signed on for the Coachella set, a press release for the planned shows makes no mention of the other two members of the band’s “classic” line-up, rhythm guitarist Izzy Stradlin and drummer Steven Adler. Adler—who was kicked out of the band in 1990 due to struggles with drug addiction—still tours on occasion, lending his musical talents to the nautical/aural nightmare known as the KISS Kruise, but hasn’t made much noise in recent years. Stradlin, meanwhile, toured with the latter-era GNR as recently as 2012, but has frequently cited his weariness with the touring lifestyle—and, we’re left to infer, the ongoing psychic toll of being lifelong friends with Axl Rose—as his reasons for avoiding any longer-term commitments to the band.